A Forest of Poets at the 2015 Perth Poetry Festival. Photograph Coral Carter. It’s Sunday, 10 am, on the corner of Lake and James Street, and a group of poets are scattered around Northbridge Piazza. Walking around this space, the writers recite five-line poems in repeated loops, each authored by the performer, touching on environmental themes, and beginning with, ‘Remember when’. This initiative by Jennifer Kornberger is, for me, the hidden gem of the Perth Poetry Festival. (I say ‘hidden’ with some irony, as it is the only event held out in the open.) Jennifer explains that the ‘Forest’ creates a meditative experience, a ‘temple of words’ in which language washes over the spectators. It is sobering and reverent – apt for a Sunday morning – and the sense of intimacy between poets and listeners heightens as concurrent poems build on and echo with one another. 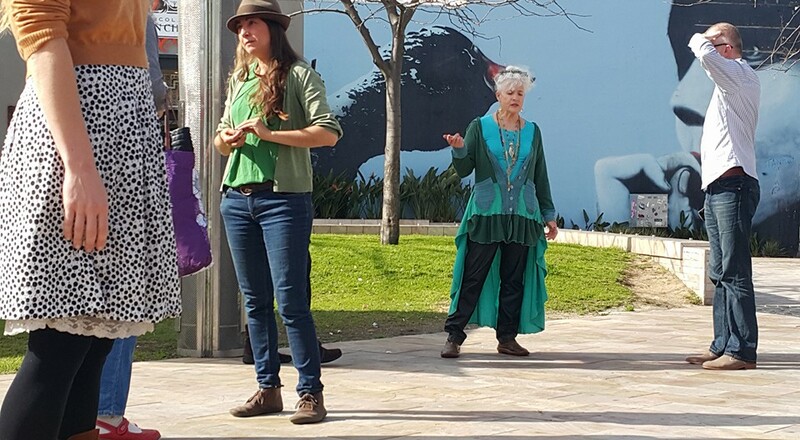 This is conceptual art meets performance poetry, meets urban flash mob, and Jennifer hopes to revisit the idea in settings such as Parliament House or at Bibra Lake. There were a few laughs when mutual viewers stood close, expecting a poem, yet I found ‘Forest of Poets’ a deeply moving and emotional experience, which left me thinking about nature and our relationship to it. Flash back to Friday 14th August, the first full festival day, where at Lorikeet House in West Leederville, we gathered for ‘Mental Wellness’, seeking to explore the subtle complexities of mental (ill-) health. Three feature poets – local, interstate and international – shared stories of conditions that defy sense, performing them in a form that also bends the rules of logic. Mark Reid used the metaphor of the monstrous ‘Og’, which he said allows him to ‘talk about things’, highlighting poetry’s capacity to articulate experience with a figurative, oblique lens. Chuckie read his performative, rhythmic verse with humour and emotion, bold rhymes contrasting with the serious subject matter. 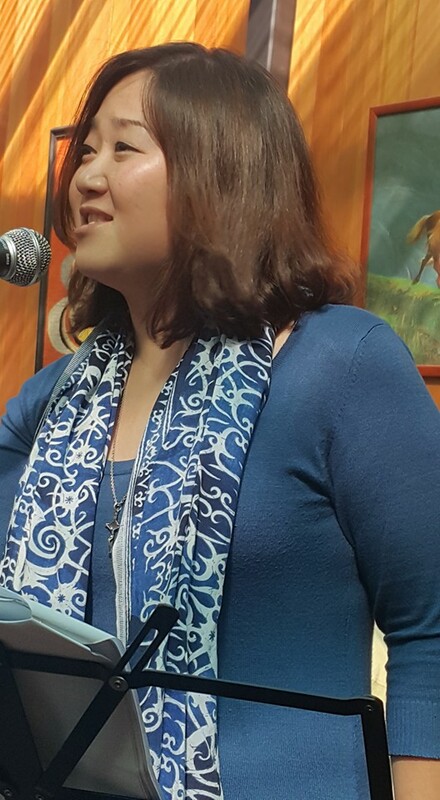 International guest Angelina Bong drew poetic parallels between writing and illness, and the open mike saw readings from Lorikeet House’s Open Your Mind anthology. WA poets Inc. fostered a compassionate atmosphere with casual, refreshing banter, an achievement when the theme is the highs and lows of the human mind. As Peter Jeffery OAM announced during ‘Asian Connections’: ‘We’re in Asia, so we better get on with it.’ This instalment, held on Saturday afternoon at the Moon Café, opened with ‘Desert Dying’, a collaboration between Peter and musician Arthur Gracias. The unusually balmy August weather was the perfect environment for this piece; closing my eyes, I was transported to dusty plains in an Afghan desert. Elements of wind, sun, dust, rain, and clouds formed central motifs of the panel, with artists taking us to Burma, Vietnam, India, Thailand, China and Malaysia. The theme of ‘connections’ was pertinent, as storytellers explored what makes our cultures distinctive, but also what brings them together. Another highlight was the performance of Glen Phillips and his PhD student, Ms Chen Peijia, who read her short story ‘Unsweetened Tears’ alongside its English translation. Audience members could enjoy the music of the Chinese language while following in English the poignant simplicity of a young adult love story. Angelina Bong expanded the horizons to Africa, exploring xenophobic attacks with her letter to South Africa, reminding us that our Asian connections exist in a wider international context. Angelina Bong performs at Asian Connections, Perth Poetry Festival 2015. Photograph Coral Carter. The schedule was busy and diverse: opening night celebrated the winning entries of Creatrix poetry contests; Northbridge Piazza hosted stimulating discussions and workshops to support up-and-coming writers. The festival reached North Perth’s Rosemount Hotel for the first heat of the Western Australian Slam, with artists such as Matt Norman and Maddie Godfrey delivering powerful slams on subjects such as illness and the issue of sexual consent. The cross-disciplinary project ‘Ekphrasis: Pictures for Words, Words for Pictures’, saw six poets responding to displays in the Art Gallery of Western Australia. With so much going on, parallel sessions were inevitable, but I would have liked there to have been less overlap so I could go to more things. 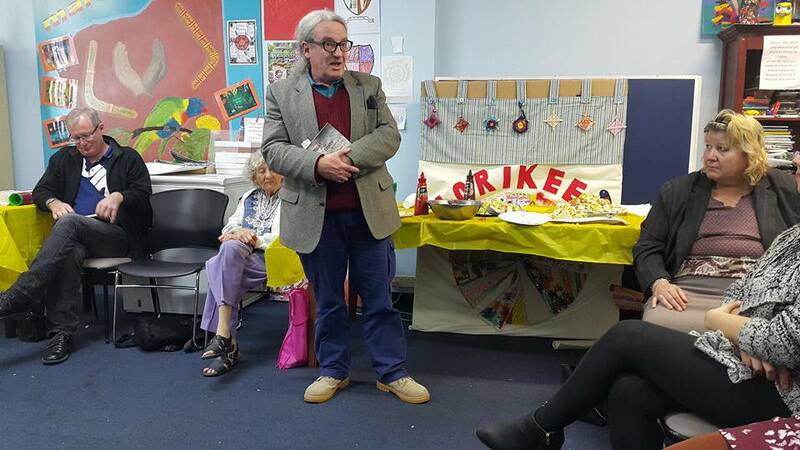 My favourite performances included the attentive, vivid Fremantle poems by Alexis Lateef, and ‘Snowman’ by Peter Jeffery – whose generosity in the community makes him a local literary treasure. Four days is a tight window – the festival having been condensed from previous years – but perhaps there might’ve been more interaction with groups such as Voicebox, Ships in the Night, and local publishing houses such as UWAP and Fremantle Press. In all, the weekend proved an approachable and stimulating platform for guests of diverse backgrounds, poetic styles, and artistic interests, and I eagerly anticipate the future of this festival and our burgeoning Perth poetry scene. This entry was posted in Amy Hilhorst, Issue 15, The Perth Poetry Festival and tagged Alexis Lateef, Angelina Bong, Arthur Gracias, Australian poetry, Chen Peijia, Chuckie, Glen Phillips, Jennifer Kornberger, Lorikeet House, Maddy Godfrey, Mark Reid, Matt Norman, Open Your Mind, Peter Jeffery, poetry by Mark Roberts. Bookmark the permalink.